How to mass delete Tridion MessageCenter warnings? I would like to be able to clear all the MessageCenter warnings with 1 button or click. I added an SDL Tridion Idea requesting this feature. Please consider voting for it. You might also notice when closing messages manually the "x" shifts slightly, making it harder to just spam mouse clicks. Maybe related to this is the idea of ignoring certain types of messages (or simply not getting the GetListActivityInstances notice after so many failures). 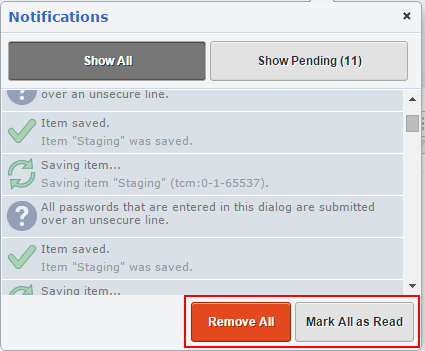 In SDL Web 8, there are now buttons to Mark All as Read and Remove All messages. The latter only appears on the Show All tab. My guess is that it's not possible to delete the messages entirely, only to set them to Archived. If you execute the following line of code in your browser console, you should see the messages go from orange to grey. Perhaps even handier than the console, is to add it as a "bookmarklet" by creating a browser bookmark with the following code as its target . Note: some helpful colleagues explained how to make this also work for Tridion 2013 SP1. See the community answer to: http://tridion.stackexchange.com/q/7418/46. Following up on top of Dominic's answer, if you want to remove the items from the list you can also call the dispose method. Note that you'll still want to call the doArchive() method first, else you'll end up with no items in the list but the notification number will still show a count for unarchived messages. Also note that even though dispose() removes it from the list in the GUI, the getMessages() method still returns these. Just like the doArchive() method sets the message.properties.inactive property to true, the dispose() method sets the message.properties.disposed property to true. You can check these properties accordingly. Access Tridion object in Browser Console?